Home » General » Which Bridal Gown Preservation Method is Best? One question our customers frequently ask is “Which method of wedding gown preservation is best – hanging or box?” Our standard answer is “Hanging preservation” if you have closet space. This answer comes from understanding the goals of wedding dress preservation. The word “preservation” can be confusing. For instance, one definition common in the English language is the term used for the preservation of food. To preserve a can of peaches the oxygen is removed allowing the fruit to be edible for much longer. But “preservation” is also the word used to describe the efforts of conservationists to protect the environment, a completely different process. Some wedding gown preservation companies focus their efforts on the first definition. They may even attempt to remove the oxygen from the wedding gown preservation. Perhaps they do not understand that it is nearly impossible to make the preservation box air tight with cellophane wrap. And in their attempts to do so, they make the wedding gown inaccessible to inspection or maintenance, and increase its exposure to plastic (the cellophane and the plastic window of the boxes.) This is not helpful as most plastics are an enemy to textile preservation. 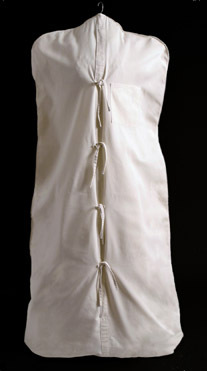 This is why hanging preservation is our recommended gown preservation method whenever possible. We know that the folding and creasing of a wedding gown that is required for box preservation, is less than ideal for long term storage. We encourage our customers who do select box preservation to follow museum conservators’ recommendations to refold their boxed gowns every few years into a different position in order to minimize the risk of permanent creases from developing. If you do not have the closet space and need to utilize box wedding gown preservation, be sure that your preservation box is acid and lignin free solid. Some boxes are acid-free on the outside only, but interior layers of the box are not acid-free. Others are acid-free, but not lignin free. Neither of these boxes will protect a wedding gown sufficiently. Our boxes at HGP are the finest available. In summary, hanging your wedding gown or heirloom garment with acid-free materials will keep it in the best possible condition. Hanging preservation minimizes folds and creases, is easiest to inspect and requires no periodic refolding. 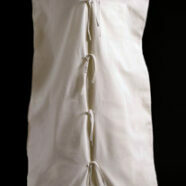 Our bridal gown care experts can clean your wedding gown to perfection and preserve it to museum standards. And for those wishing to save some money, our Museum Method preservation kits have everything you need to preserve your wedding gown, formal dress, professor or pastoral robes, etc. in “optimal storage” conditions.